Drottninggatan a way that connecting two central place in downtown Stockholm is Gamla Stan and T-Centralen Station. Each day, the road was fully with thousands of passers-by. Drottninggatan filled with clothing stores, souvenirs, and restaurants. Want to try to stop by the boutique’s famous H & M in Stockholm? There in Drottninggatan. 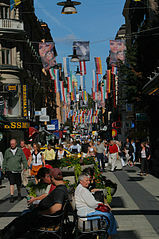 Although Drottninggatan crammed shops and tourists, this road remains one of the favorites for the tourists. Contains clothing stores contemporary classical style building occupies a beige and yellow. Meanwhile, some newly built restaurant look more modern by creating a modern blend of classic building eye-catching. Coffee shops and restaurants are opening up to the shoulder shop, invites guests to relax while enjoying the summer sun, take exist for the tourists and the people of Stockholm. For artists, street Drottninggatan area is a paradise for thousands of tourists who pass through this place for their money is mine. For frugal tourists, it can be an additional attraction that can be enjoyed freely. Places shown that street artists are quite varied, ranging from the most standard artists who sing and play musical instruments, human statues dressed in a play to be unusual and would move if there are members of coins, to singers who were armed only with a glass of water, but create a variety of sounds. Street artist with an unusual action and somewhat dangerous as using a knife, fire or sword, usually more in demand and more attention of people. In one corner of the street looks a mother and her children join the singing. The mother and child playing a tuning fork sing. You’d be surprised by what’s in the developed world there are people who could make use of children for singing and making money? Apparently there are different explanations of the sights you see. Children in Sweden since childhood has been encouraged to express themselves. So it actually made it more inclined to attempt to get his son dared to sing in public. Money raised just as a bonus. Turns not only attraction here seek his fortune street, street gambling also not want to miss. If you are curious, just try to come watch. How to play fairly easy, Seller just hide a coin in between three cups, glasses were randomized and later visitors to guess the location of the coin stay saved. Some people place bets and pointed to a different glass. Bets are placed usually about 100 SEK! Although the game was pretty easy, a few people still choose wrong guess and have lost considerable money. The tourists usually saving direct go when glass scrambles again and invited to participate in betting. Approaching the end of Drottninggatan, some tourists sitting on lawn chairs available in the middle of the road. Some wooden chairs look intentional serve on the outskirts of the busy road and a number of women offering something to passersby. And it turns out they sell massage services. Smart selling strategies. After a walk around in Drottninggatan, you will definitely pretty sore foot. Rate offered is usually 50 SEK for ten minutes Thai massage. Many interesting things you get when just by passing Drottninggatan. Look forward to exploring and exciting way for exploring in Stockholm with us.